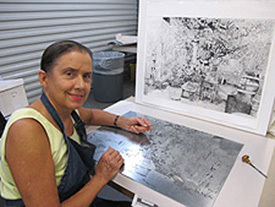 “A Retrospective: Etchings and Paintings” at the Marlor House Sunday, September 7 – Friday, October 31Allied Arts invites you to “A Retrospective: Etchings and Paintings” an exhibition by artist Stephanie Scott. The Milledgeville Civic Woman’s Club will host an opening reception honoring the artist from 1:00-3:00 pm on Sunday, September 7 at the John Marlor Arts Center, 201 North Wayne Street, Milledgeville. The public is invited to attend. Besides the etchings, which are done in black and white, she has done a series of colorful watercolors of imaginary places influenced by the landscapes in the Georgia lake country. In 1992, Scott began a note card business publishing from her larger watercolor studies of flowers, many of which she had grown; She continues that today and works full time as a professional artist. “A Retrospective: Etchings and Paintings” will be on display through Friday, October 31. Gallery hours are Monday through Friday, 9:00 a.m.- 4:30 p.m., or by appointment. There is no admission fee charged to visit the gallery.